The Carolina Hurricanes have introduced a third jersey to their uniform options. The black look will feature the team's new secondary logo. The black helmets feature a new Canes wordmark on both sides. 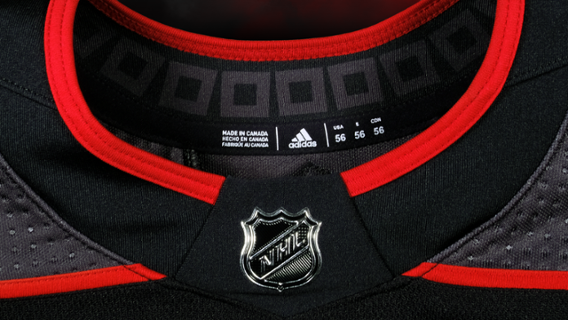 On the inside of the collar we see a ghosted warning flag pattern, similar to the red and black warning flag pattern we have seen on the inside of the team's other jerseys. The shoulders of the jersey feature a "Storm Grey" color with the right shoulder having a ghosted version of the Hurricanes' primary logo and the left shoulder a ghosted version of the North Carolina state flag. Front and center of the new jersey you see the team's new secondary logo, which features two flags to indicate a hurricane warning, anchors the jersey as the crest.